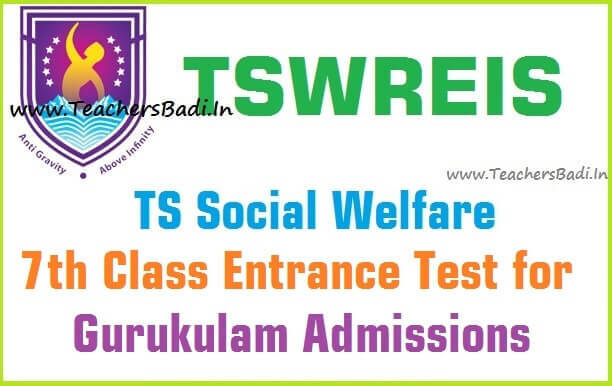 TS Social welfare 7th Class entrance test 2019/tswreis gurukulams class 7th admissions, tswreis online application form, last date for apply, 7th class entrance hall tickets, TS Social welfare 7th Class entrance test results, Certificates verification dates, Social Welfare Residential Schools Common Entrance Test-2019 for Admission into #7th Class, Telangana SWAEROCET 2019, Seventh class admission test details given here. The TSWREI Society visualizes to provide quality modern education to the talented students belonging to marginalized section of Society predominantly from rural areas through the use of modern TECHNIQUES, Pedagogy and various experimental learning activities in a stress free environment to make learning a joyful experience. As per GO.no.20, dated: 02/06/2019, the TS Social Welfare department is going to release the 7th class admission test 2019 in this month and online application forms would be invited from the eligible candidates for admission into Class VII for the academic year 2019-2020 in newly sanctioned 103 Social Welfare gurukulams and applications have to be submitted ONLINE. 1. The students belonging to SC & ST should have born in between 01.09.2004 to 31.08.2007. 2. During the academic year 2018-2019 the candidate must be a bonafide student of Class VI of a recognized school. 2. Admission test will be held in English, Mathematics and Environmental Science based on State Syllabus of 6th class prescribed by Telangana State Government. About TSWREIS: Telangana Social Welfare Residential Educational Institutions Society (TSWREIS) has been successfully running 134 Institutions exclusively meant to cater to the educational needs of the children belonging to the marginalized communities. Ever since its establishment, the TSWREI Society has been cruising along the path of glory, disseminating education, to the economically and socially backward communities. In nearly three decades of its existence, the society had moulded the lives of thousands of marginalized children. The Government of Telangana recognized the pivotal role of the Society in shaping the future of the marginalized people. The visionary Hon’ble Chief Minister, Government of Telangana who gives top priority to the education of the downtrodden people was greatly impressed by the path-breaking transformational work done by the Society. On the occasion of the 125th birth anniversary of Dr.Babasaheb Ambedkar, Hon’ble Chief Minister of Telangana announced One Hundred and Three (103) New Residential Schools for Boys and Girls and Thirty (30) Residential Degree Colleges for Girls exclusively for the marginalized sections to be run under the TSWREI Society from the Academic Year 2019-2020. Sir this is mahesh from wanaparthi dist. Am waiting for 7th class entrance exam. Please notify me if notification released. My cousin sis studying 6th class_ZPHSChennram,wanaparthi dist. She want to study in social welfare schools.why Because her family also very poor . recently she lost her mom also. She don't have interest(patience) to force for further studies to his father. Plzzz notify me sir. we want to apply for that. Please please sir..